Re: Looking for a nice LV boxcar? Well, I would certainly consider donating some money to preserve this unique item at a "LV" themed RR museum were the collection is small and manageable. And a location with actual LV heritage would be even better. The R&GV "operating" museum has way too much "stuff" and not enough funds or volunteers to properly maintain it all (in my opinion). Might be wiser to get it to a LV only museum that can take proper care of it. Keep us updated, I'll donate to get it to a proper "LV" home, unfortunately I will not support moving it to the R&GV museum. Why don't we put boxcar with the caboose in Manchester? "LV" themed RR museum were the collection is small and manageable. And a location with actual LV heritage would be even better. That's great, but does such a thing exist? 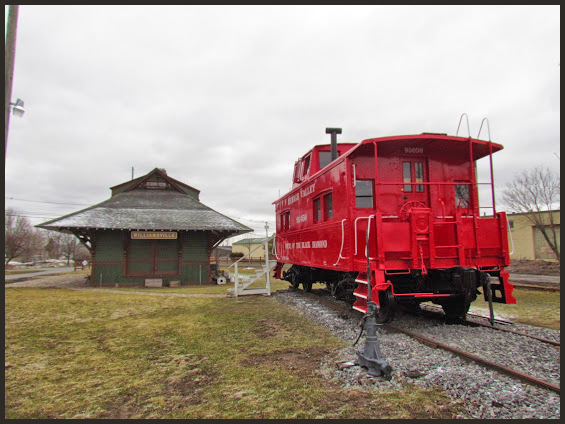 The Williamsville depot fits the description of LV heritage rather well. They already have an ex-LV caboose and are supposed to get a former LV S2 soon. With that being said, I will politely disagree with the negative comment about RGVRRM. They are a fine organization IMO. RGVRRM also has a historic LV locomotive, which is operating, RS3 No. 211, and a LV caboose. They could also build a complete LV train if they had this boxcar. Yes, they arent on LV rails, but IMO that's not a big deal. They are the Railroad museum for the Rochester area, and the LV served Rochester. The museum is also 1.25 miles from the LV mainline. IMO, any of these three would be great options. Sayre has been contacted, has anyone alerted Williamsville? There is a track panel in place in Menden and it was once mentioned a box car was going to be displayed there. Is that still the case and do they have a box car lined up already? That said, I feel a museum is a better home than a lone static display which can be easily vandalized. I have always wanted a box car for storage on the “back 40” like so many of the farmers did in years past. These days though, shipping containers are much more affordable than moving a box car into a field! The boxcar is at Rochester Junction instead of Mendon. There is also a flatcar. RGV is working on a proposal to acquire the boxcar and bring it to Industry. Stay tuned. 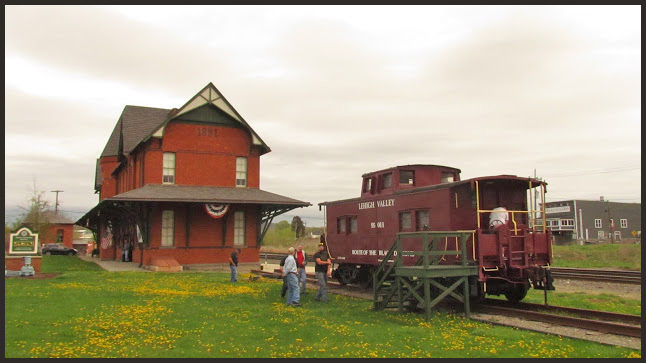 It's my opinion that other railroad museum operations around Western New York besides the R&GVRR operation should be encouraged to "spread" their wings and acquire artifacts that match their own location specific heritage. The R&GVRR Museum has no historic heritage. It was only an Erie RR station stop that had no passenger service after the 1920's. The "operational" railroad at that location is a modern (post 1970's) amusement park. Other locations, Sayre, Manchester, Williamsville, etc. should seek out historic railroad artifacts that have an actual historic lineage to the artifact in question. A boxcar that actually passed by Sayre Pa. numerous times during it's railroad life would be an significant remembrance of the LVRR. As opposed to another poorly maintained collected RR car at the R&GVRR Museum. The R&GVRR has far too much "stuff" and they are barely able to properly care for any of it. The R&GVRR museum has some RR artifacts that are "shrink wrapped" because they cannot afford to restore them. They have a unique nearly 100 year old gasoline powered locomotive that was restored after great effort and expense by volunteers that is "stored and not available for display". They have TWO steam locomotives that are "not available for viewing by the public". I think the R&GVRR folks need to "step aside" and let some other folks try their hand at restoring historical RR artifacts in an appropriate historical setting. I think you've made your point very clear and your feelings of, for lack of a better word, hatred for the RGV museum. Something about a dead horse comes to mind. What about the RGV showing interest in a car is suddenly discouraging other museums from "spreading their wings"? It's like saying that I should be discouraged from showing interest in or making an offer on a house because someone else has shown interest in it. That's not how it works. If you have another museum in mind, maybe you should contact them and put up some dough of your own to help them make a "bid" on this car, or leave yourself out of it. Ultimately it is up to the seller to decide who to sell it to. I personally have no stake in the RGV or any RR museum, nor do I have any interest in getting involved in a turf war about who is "more right" in owning this car because of location or heritage. But if no other museum is making any kind of noise about purchasing it, I'd much rather see RGV purchase it than have it go to scrap. How is stating fact, "hatred?" The fact is they don't have the funding or manpower to maintain what they have. That's not a statement against them. That is a statement of fact. They are doing the best they can with what they have, but they don't have much to work with. Ignoring that fact does not make it go away. What railroad museum isn't strapped for cash and/or help? This is likely why other museums are not "spreading their wings" as stated. Their wings are already spread as wide as they can go. That said, it is far better that the car go to the RGV, than scrap. Moving it there does not preclude anyone else from acquiring the car in the future. Windseeker1 wrote: There is a track panel in place in Menden and it was once mentioned a box car was going to be displayed there. nydepot wrote: The boxcar is at Rochester Junction instead of Mendon. There is also a flatcar. Rochester Junction is in the Town of Mendon. With that being said, LV's Mendon station was a few miles to the east, so technically both answers are correct. mkirsch wrote: The fact is they don't have the funding or manpower to maintain what they have. That's not a statement against them. That is a statement of fact. They are doing the best they can with what they have, but they don't have much to work with. Ignoring that fact does not make it go away. Curious where you are getting your "facts" from? All current projects are funded and have volunteer manpower, though we can always use more of both (like any organization). Rather than dragging an organization through the mud with false accusations and false information, why don't we stick to the discussion at hand, which is the LV boxcar. True enough Snoozer but the fact remains that there is an empty track panel in “downtown“ Menden just waiting for something to be placed on it. Last edited by Windseeker1 on Thu Apr 12, 2018 6:36 pm, edited 1 time in total. As a resident of Mendon, if you said I'll meet you in Mendon and went ant sat at Rochester Jct, you'd be waiting a long time.